In some cases the culture of scientific research does not support or encourage scientists’ goals and the activities that they believe to be important for the production of high quality science. There seem to be widespread misperceptions or mistrust among scientists about the policies of those responsible for the assessment of research. Among all the relevant stakeholders, concerns about the culture of research are often on matters that they think are outside their control or are someone else’s responsibility. Funders: ensure funding strategies, policies and opportunities, and information about past funding decisions, are communicated clearly to institutions and researchers; and provide training for peer reviewers to ensure they are aware of and follow assessment policies. Research institutions: cultivate an environment in which ethics is seen as a positive and integral part of research; ensure that the track record of researchers is assessed broadly; and provide mentoring and career advice to researchers throughout their careers. Publishers and editors: consider ways of ensuring that the findings of a wider range of research meeting standards of rigour can be published; consider ways of improving the peer review system; and consider further the role of publishers in tackling ethical issues in publishing and in promoting openness among scientists. 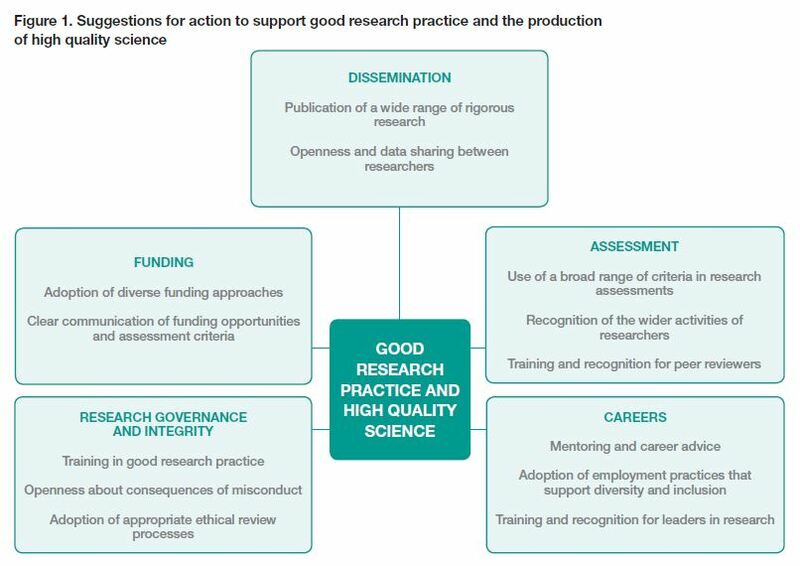 Researchers: actively contribute to the adoption of relevant codes of ethical conduct and standards for high quality research; use a broad range of criteria when assessing the track record of fellow researchers; and engage with funders, publishers and learned societies to maintain a two-way dialogue and contribute to policy-making. Learned societies and professional bodies: promote widely the importance of ensuring the culture of research supports good research practice and the production of high quality science; and take account of the findings of this report in relation to guidelines for members on ethical conduct and professionalism.